We are very pleased to inform you that HH Bhaktimarga Swami will be giving a special class coming Sunday at ISKCON Scarborough. The program starts at 10.30 am. It is also Pamomocani Ekadasi coming Sunday. 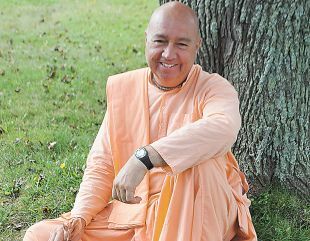 Over forty years ago it was a youthful quest for the life that leads Chatham, Ontario born Bhaktimarga Swami, (formerly John Peter Vis), to adopt an Eastern order of monastic life that landed him in the Hare Krishna movement. Since that time, as a celibate monk, Swami has evolved as an instructor of bhakti-yoga and mantra meditation. His presentation on this subject of life, based on the popular Hindu text, “Bhagavad-gita” is lively, candid and informative. With a background in fine arts, Swami also developed a passion for the performing arts. Even in the course of his duties as a monk, he expands his portfolio and manages to take an active role in theatrical productions from epics of ancient Indian origin. Casting, scripting, and directing morality theatre takes him annually to venues from North America to India and Africa. 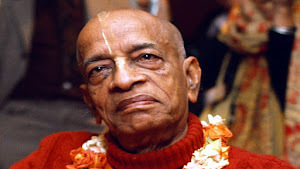 Finally, Bhaktimarga Swami achieved a remarkable feat in 1996 when he went the way of a pilgrim and walked on foot cross country from west to east and then back for a return journey from Cape Spear, Newfoundland to Vancouver Island in 2003, going full circle. He likes to share his unique experiences and fond memories on the road after trekking 16,000 kms. Swami is a consistent feature in “The Longest Road”, a recent National Film Board documentary detailing the history of the people who shaped or were shaped by the Trans Canada Highway, the world’s longest continuous maintained road.